Peoria, IL - It was an afternoon game on Super Bowl Sunday to wrap up a season-long four game home stand for the Bradley Braves (11-11) (5-6), and they would be taking on the Loyola Ramblers (5-17) (3-8). This one got off to a very fast start, as Bradley's Gabi Haack hit a three just 11 seconds into the game to put the hosts up 3-0. Danielle Brewer added a jumper roughly two minutes later to make it 5-0, but then Loyola went on a 5-0 run of their own, capped by a jumper from reigning Missouri Valley Newcomer of the Week Abby O'Connor. From that 5-5 tie with 5:11 to go in the opening quarter, the best the Braves would see is a tie. They would not lead for the remaining 34:49 of the game. Bradley would keep things close though, as Loyola's lead was only 13-12 after 10 minutes. The second quarter was just a close as the first. Bradley would get as close as one with 2:16 to go in the half, when Chelsea Brackmann made a layup to set the score at 24-23 Loyola. Brackmann had four of her six points in the second quarter. Yet neither team's offense was flowing quite well enough, as the two teams had not reached the 30 point mark at halftime. Loyola would be holding on by three, 26-23. The second half started to see momentum swing Loyola's way. In the third quarter, the Ramblers' Katie Salmon and Kailyn Strawbridge combined for 17 of Loyola's 23 points in the quarter. Bradley's offense was found right where it had been in the first half, as they were only able to total 12 third quarter points. Four Braves had scored, paced by four free throws from Vanessa Markert. Loyola's lead was up to 14 by quarter's end, 49-35. The Ramblers got off to a good start in the fourth as well, increasing their lead even further, getting up to 20 points, when Salmon netted a layup with 7:28 to go, putting the visitors ahead 58-38. 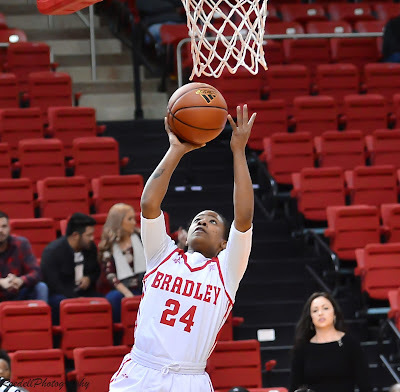 From that layup, Bradley began to make a furious comeback, going on a 18-5 run, which was capped by a three point play from Shunseere Kent, who had eight of her game-high 17 points in the quarter. Also, Gabi Haack pulled down her tenth rebound of the game with 1:11 to go, officially giving her a second consecutive double-double. However, that Bradley run was just not enough. Loyola would still come out on top, 71-61. After the game, Bradley Head Coach Andrea Gorski thought the loss had to do with her team's determination versus that of Loyola. "I thought Loyola played like they had something to prove. We played like we're going with being mediocre." Gorski went on to discuss what she saw get her team back in the game, having gone on that late run. "When we can get Nyjah in there and get into a press, we're a lot better. She got in foul trouble and we weren't able to get into pressing situations. That kind of gets us going. It happened too late in the game for us." Continuing the theme of determination, Gorski thought Loyola was certainly better in that regard. "You can't just say 'oh, we beat them last time', and expected to beat them the next time. That's high school. This is a game they (Loyola) really wanted and they played like that." In the first half, Gabi Haack only took one shot, making the aforementioned three less than a minute in. As to getting more looks for Haack, Gorski said they had that in the plan. "We called some sets for her, and we didn't execute them. We took some bad shots early on, instead of trying to find our shooter." Haack thought that the late offensive rebounds by Loyola, creating extra offensive possessions in a key part of the game, played a major factor. "We needed to get those boards. Those were crucial." When it came to getting more looks, Haack looked at it from her perspective as an individual, even citing the potential for even more rebounds. "I just have to keep crashing, keep getting some o-boards. Maybe just come off some screens, look to cut more." The freshman also talked about just how close that comeback was to being a lead. "I just think our energy and our body language was a little down and we just looked a little defeated. We definitely had a chance to catch up to them." 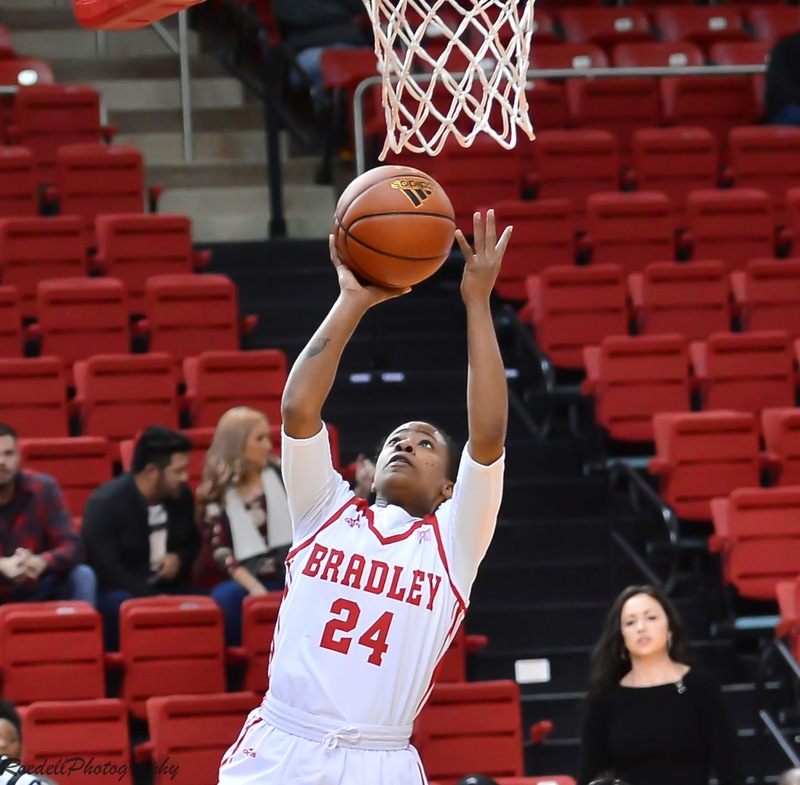 Bradley will hit the road for their next to games, traveling to Springfield, Missouri first to take on the Missouri State Bears on Friday at 7:00 pm.